Hello. My name is Penny and I am recovering from a fear of flying. Yes, that's right. This wanderlust explorer is was terrified of flying. My fear hasn't stopped me from flying. I've sucked it up and got on with it but every year it gets a little bit worse. I get a little more anxious, a little more terrified and the low rumbling dread gets a little louder. Each and every year that passes my fear of flying intensifies. I wasn't always afraid of flying. And I'm not alone. 10% of New Zealands population can not or will not fly. I travelled regularly from the age of 13 and never had any problems but somewhere in my early 20's my husband remembers me telling him I was scared before boarding a flight to Hawaii. If you're not afraid of flying then you simply won't understand how crippling it can be. I have a very unsympathetic travelling companion in my husband. He can't understand what all the fuss is about. While he is settling in to enjoy a movie and his first bourbon of the flight, I am clutching his hand crying, willing him to save me because I just heard a funny noise and surly one of the wings is about to fall off. Now that we have two children I am extremely conscious of not showing my girls I'm frightened. I can't grasp at my four year olds hand in hysterics so I internalize my feelings to point of internal combustion. After our last trip to Hawaii I knew something had to change. Every noise. Every bump. Every minute change is engine speed. I was grabbing the arm of the nearest flight crew to ask what was going on. Most of them looked genuinely surprised at me, told everything was fine and carried on with their duties. I didn't dare move about the plane in case it caused the plane to tip over. God forbid that the seat belt sign came on. Even worse if they flight crew were asked to take their seats too. I'm silently but wildly gesturing across the aisle for my husbands attention, thinking "what the hell is going on?". How can he be so calm when clearly the plane is about to nose dive and kill us all??? Something had to change. I just couldn't keep flying with my anxiety levels through the roof like that. So I enrolled in a course called Flying Without Fear which helps people just like me. I sent away for some information years ago but never bothered to do anything about it. At that stage I wasn't too bad and felt like I could deal with things on my own. But as I now know, these feelings don't go away but intensify over time and need to be dealt with. The course took place over four nights in the Air New Zealand Flight Simulator Building at Auckland Airport. Classes started at 6.00pm and ran until around 10.30pm. Logistically it was a bit of a nightmare for me - I live just about as far away from the airport as you can get so I arranged a roster with my Mummy friends to look after my girls after school (thank you thank you thank you) so I could be on the road by 3.30pm at the latest to arrive at the airport in time. There were nine women in our group - not that I was surprised by that fact! According to a study by Boeing for every 9 women that have a problem with flying, there are 2 men. We were all different ages, races, occupations and backgrounds. Each of us was frightened by a different element of flying - claustrophobia, terrorism, turbulence and hundreds of old traumatic flight experiences. For me it was a fear of mechanical failure. A wing might fall off. An engine might fall off. Bird strike. "Turbulence" might send us plummeting. An unfamiliar noise meant something was malfunctioning. The ground crew hadn't tightened all the nuts properly. And the knowledge that I couldn't get off the plane if I wanted to. A general mistrust of the plane and everyone that had anything to do with it. What we all had in common was a strong desire not to feel this way. To become better flyers and comfortable passengers. We soon learnt that the weakest part of the plane is it's passengers. The first thing I wrote in my notes on the first night of the course was "You know nothing about flying. You have no real information about what's going on". I thought "Great! Tell us! Cure us!". But while lack of not knowing can be a problem, knowledge doesn't cure the anxiety. Having all the knowledge only makes a highly knowledgeable bad passenger. And we had all unknowingly spent years making ourselves bad passengers and it wasn't going to be undone an instant. We spent the first two nights peeling back the layers of anxiety. While fear can be a positive response and mild anxiety can be healthy for motivation but for us it had become a problem. Feelings are 3x more powerful than facts and we were exponentially winding ourselves up. We learnt about our "parent, adult and child" brains and how they impact our thoughts and actions. In one on one sessions with Grant we each assessed our family backgrounds, life events and stress levels. Had we always been afraid of flying or had we once been ok with flying but were now scared of it? I couldn't pinpoint when flying became a problem for me. There had been lots of little, insignificant aircraft related moments that built up over time. While others in group knew the exact moment it had all gone wrong. As a group we talked at length about anxiety, it's physical reactions (sweaty palms, racing heart and tension), and psychological reactions - hypersensitivity, hypervigilance, hypercriticism and hyperventilation and a disease called perfectionism. And that my dear readers is me right there. A perfectionist. Apparently (on occasion!) I have "high standards, high ownership and am stubborn and inflexible". (Just ask my Mum what I'm like when she's trying to help me decorate one of my kids birthday cakes - I think you'll find she'd agree). Perfectionists spend a lot of time trying to screw things down and be in control. But the one thing you aren't, when flying, is in control - as much as we like to think we are keeping the plane flying in a straight line by gripping the arm rests - aye Grant :) We had to start to turn this thinking around. There is no magic cure. While we may have wanted all the answers right there on the spot (that's another symptom of anxiety - we are terrible at waiting!) we had to chip away at our fears. As Grant said "How do you eat an elephant?" One bite at a time. We started by learning relaxation and breathing techniques. The human body tenses up 3x faster than it relaxes so we learnt daily exercises to help relax our muscle systems. New Zealanders are notoriously bad breathers so we learnt correct breathing exercises as well as some excellent calming breathing techniques for stressful situations. Grants famous 4x6x6x3 is amazing! - Air is not "nothing". Air behaves like and has the same properties as thinly spread liquid. When you are "up there" you are not in "nothing". You are in liquid. - Flying is natural! Yep, not one of us believed that old chestnut before we started the course but it turns out it is. Wind going over and under the wing creates lift. The engines move the plane forward. When lift and weight are equal you get upward flight (in very simple terms). That's why small planes are often tied to the tarmac, in the event a big gust of wind comes along and lifts the plane. - Aircraft can not simply fall out of the sky. All planes can glide at a rate of about 1000 feet per minute which is so slow the passengers often won't even notice and this gives the pilots plenty of time to assess any issues. - Most modern passenger jets are designed to fly on just one engine so in the extremely rare event that something should happen to the other engines, you can still safely arrive at your destination. - Each engine has up to four fire extinguishers in them and the pilot can isolate an engine to avoid further damage. - Planes are designed to act like a boat with the doors designed to be above the water level. In the rare event you land in the water the tail will be in the water and you would evacuate over the wing. - Although we can't see it, air is not constant. It is full of variety, changes in temperature, density, weight, pressure and wind. There are no "air pockets" and a plane can not drop in mid air even though people swear they've been on a place when it's happened. The speed at which we are travelling (800km per hour) grossly exaggerates any up, down, left or right movements. - Think of turbulence as a car hitting a judder bar at speed. The car rises and then returns to the road - with a bit of a bump. - When in the air you are never more than 180 minutes away from land. - An airplane door can not be opened mid flight (no matter how much someone may want to) nor can it be sucked open. The door is locked from the floor and sides as well as by the outward pressure on the plane. - The news and reporters love to sensationalize air accidents. Be careful what you read! - There are back ups to back ups to back ups for every potential problem. - In 2016 there were 18 commercial plane crashes, 8 of which had fatalities in which 296 people died. However, there were 36 million successful take offs and landings involving 3.8 billion passengers! My ever lasting memory of Flying Without Fear will be Grant stamping his feet in frustration in front of us and saying "You will NOT die in a plane crash!!!" The final evening of the course involved a behind the scenes visit to Auckland International Airport going through the whole process of departure from check in to getting on a plane which all seemed too easy with the confidence that we weren't actually flying anywhere - although I have to admit my stomach did a few flips when I smelt the aviation fuel on the air bridge. Back in our meeting room we went through the whole process of take off and landing. Every noise, every sound, every smell. This was incredibly helpful as it's the noises that I am hypersensitive too. We learnt how to sit during take off and landing, when to use our breathing exercises, how to dress to fly and lots of special little tips and tricks to focus on rather than the take off and landing itself. And after four exhausting days of talking, thinking, eating and sleeping flying, that was it. We had graduated from Flying Without Fear with the confidence that we had the skills and knowledge to at the very least to become neutral about flying and better passengers. Perhaps one day we might even come to love it. Who knows! If neutral is all I ever become then I will be thrilled. I can't stress how much this course has helped me. There was one final and optional part of the course that didn't exactly fill any of us with excitement - a return flight to Wellington on Saturday morning. But we could all see what a valuable experience this was and the whole group signed up to go. We would have Grant on hand to remind us of our 'Passenger 101' training and talk us through any questions or issues that may arise. When we landed in Wellington and the pilot advised there was an issue with the auxiliary power, 18 eyes nervously darted straight to Grant for an explanation. Ha! Despite our odd hopes of a bumpy flight to test us, it was pretty smooth sailing there and back. It was amazing getting to all fly together. We'd gotten to know each other really well over the last week and we each knew how the other was feeling. No one else would understand why we were sucking on Oddfellows, or wriggling our toes, or enthusiastically shouting WOW as we walked down the air bridge, or quoting Grantisms to each other. Grant spent most of the flights taking about music and record players but the sound of his voice was reassuring. We even joked about recording his voice to play to ourselves during our next flights. but most of all, we were all so very proud of ourselves and each other. Since our course finished we have created a Facebook group and keep in touch with each other. Whenever someone flies we all let each other know and we are flooded back with messages of support. It might sound a little odd but unless you're frightened of flying I guess it won't make sense. 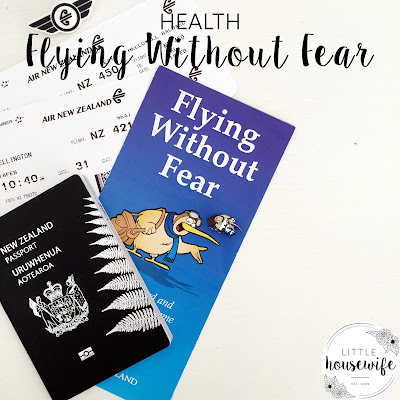 Before Flying Without Fear, I would lie in bed at night and dread a flight I was taking in six months time. Upon departure I was a wreck! I can honestly say that post Flying Without Fear the building dread is no longer there. I don't even think about flying anymore which is a huge step. I actually watch planes fly over head now which a bit of fascination. I can look forward to our holiday without a constant churning stomach taking the shine off it. We leave for Hawaii in June which is a nine hour flight. I'm not expecting my behaviour will be impeccable but I don't think I will be listening for or preempting problems like I have in the past. If I can just be comfortable and relaxed then I have made a complete success of my time in the Flying Without Fear programme. If you or someone you know is a nervous flyer or bad passenger then I really can't recommend Flying Without Fear enough. It will change your life! Courses are held all over New Zealand through out the year. Contact Grants wife Sue for course information and location details. Thank you so very much for Grant and Sue for having me on board. It's been life changing. Congratulations!!!! Well done, you have done this not only for yourself but your children too and future family holidays :) I have a 13 year old who is scared of flying, we have done lots of flying as a family but our last flight home from Europe she 'lost it' due to turbulence and now doesn't want to go on a family holiday in Thailand. Do you think the course would suit a 13 yr old? Have a fun time in Hawaii!! !